In 1848, an archaeological expedition working in Egypt discovered strange hieroglyphs on a ceiling beam at an ancient temple in Abydos, several hundred miles south of Cairo. The hieroglyphs were carefully copied and brought back to Europe. The mysterious images gave rise to heated debate amongst Egyptologists. Eventually, however, they were dismissed as bizarre objects that nobody could adequately explain and were forgotten. That is Abydos Helicopter. In the mid 1990’s photographs and videos, taken primarily by tourists who had visited Abydos, began to appear on the internet. They depicted the ‘strange machine hieroglyphs‘ originally discovered in the nineteenth century. The temple in which they were found was built by Pharaoh Seti I around three thousand years ago. To the modern viewer it is clear that the strange machines, so mysterious to the Victorians, are in fact various types of flying craft and a tank. One of the aircraft is a helicopter. There is no mistaking it. It has a rotor blade, cockpit and tailfin typical of a modern battle helicopter. On the face of it, this is one of the most astounding discoveries ever to have been made in Egypt. Not surprisingly, perhaps, the ancient high-tech machinery glyphs have been dismissed out of hand by modern Egyptologists. Given the great body of knowledge that now exists with regard to ancient Egypt, the concept of the Egyptian military flying around in sophisticated aircraft three thousand years ago is simply ludicrous. The conventional explanation for these mysterious carvings, fielded by Egyptologists, is that they are just illusions. The most likely cause of these anomalous hieroglyphs is considered to be due to re-facing and re-carving of the original temple stonework, and to weathering effects. Over a protracted period of time, it is believed that parts of the reworked stone have fallen away, revealing older hieroglyphs underneath. In effect, sections of the original and re-carved hieroglyphs have become overlapped to produce altered images that bear little, if any resemblance, to the original images. Such images are termed ‘palimpsests‘ by Egyptologists. Re-carving of inscriptions was a common phenomenon in ancient Egypt. When newly installed Pharaohs adopted the structures of previous rulers, they sought to make them their own by overwriting the hieroglyphs of their predecessors. Indeed, some refurbishment of the Seti I temple at Abydos is known to have taken place when it was acquired by his son and successor Ramasses II. Looking at the photograph shown above, however, or higher resolution photographs readily accessible on the internet, it is clear that nothing has fallen away from the carving of the helicopter and other military craft. They are continuous intact images. The helicopter, for example, is precise in every detail, down to its finely carved rotor blade. Recently, the respected Arab newspaper ‘Al-Sharq Al-Awsat‘ published several photographs taken at another Egyptian temple, the Amon Ra Temple in Karnak. The photographs are of carvings believed to be three thousand years old. They appear very similar to the carvings found at Abydos. There is a battle helicopter with a distinct rotor and a tail unit, and nearby, other modern-looking flying craft. So, there are in fact not one, but two almost identical sets of carvings at Karnak and Abydos. What are the chances of that being due to identical palimpsest effects at both locations? 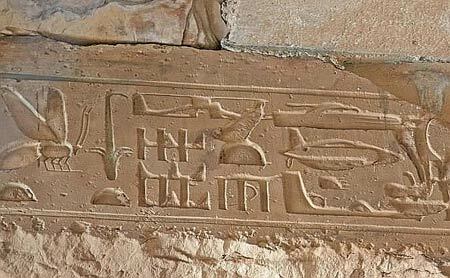 So accepting the fact that the ancient Egyptians did not have the technology to build helicopters or other aircraft, where did the images of the flying machines come from? The history of the human race has been turbulent to say the least. Many of the fabulous ancient libraries, such as the library at Alexandria and the vast libraries of ancient China have been destroyed. Much of the priceless evidence of the distant past has been obliterated. Fortunately, however, ancient writings have survived, particularly in India. Amazingly, some of these ancient texts speak of highly sophisticated flying craft. Recently, it was reported that the Chinese have discovered extremely old Sanskrit documents in Tibet and sent them to the University of Chandrigarh in India to be translated. Apparently, the documents contain instructions for building spacecraft. Surprisingly, the Chinese announced that they were evaluating this ancient technology for potential inclusion in their space program! There is increasing evidence that the so-called ‘Rama Empire’ of Northern India and Pakistan is far more ancient than had been originally supposed. Remnants of its large sophisticated cities are still to be found in the deserts of Pakistan, and in Northern and Western India. According to ancient Indian texts, the Empire of Rama had flying machines which were called ‘Vimanas‘. The texts on Vimanas are numerous, and highly detailed. The ancient Indians wrote entire flight manuals on the control of the various types of Vimanas, many of which are still in existence; some have now been translated into English. Different types of Vimanas were described; some were saucer shaped, others cigar shaped. The Vimanas appeared to be powered by some sort of anti-gravity device, as they took off vertically and were capable of hovering in the air. Interestingly, it was the Nazis who developed the first pulse-jet engines for use in their V-8 rocket bombs. Prior to and during World War II they had an intense interest in ancient civilisations, and India and Tibet in particular. They mounted many expeditions to these two countries in search of ancient knowledge and technologies. Perhaps it was from here that they gleaned critical information that enabled them to develop jet engine technology, and even saucer-shaped flying vehicles. It is a documented fact that the Nazis had their own flying saucer programme during the last war. It is possible that knowledge of a previous highly advanced civilisation may have been preserved by ancient secret Brotherhoods. When Alexander the Great invaded India over two millennia ago, his scribes chronicled an attack by ‘flying fiery shields‘ that panicked the horses. These flying vehicles did not deploy any weapons against the invading army, which marched on to conquer the country. It has been speculated in many books that secret Brotherhoods have preserved and maintained Vimanas for many thousands of years. They are alleged to keep them hidden in caverns and underground bases. The compelling temple carvings at Abydos and Karnak, and ancient texts from India and Tibet, speak of a bygone era when powered flight was highly advanced and even commonplace. They speak of a long-lost civilisation that was at least as advanced as our own. It was not a civilisation that existed three thousand years ago, but much further back in the mists of time; a civilisation that was suddenly wiped from the face of the Earth. Unfortunately, as has been seen all too often, history has a habit of repeating itself.